Did Major League Baseball ever use an orange ball? Yes... kind of. 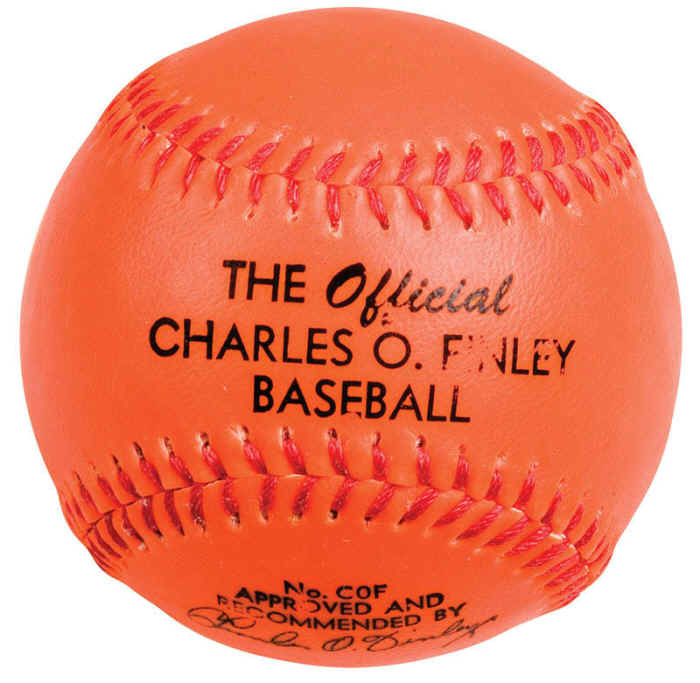 In 1970, the Owner of the Oakland A's, Charlie Finley introduced orange baseballs that were used in the A's exhibition games that year. "Finley thought using white baseballs was for the birds. He figured, hey, orange baseballs might be more popular with the fans and thus good for the game. After all, orange stands out better and if it stands out better, then hitters might be able to see it clearer. If they see it clearer, more runs might follow. And if baseball history teaches us anything, it’s that fans like offense." Fair enough. This should go over well. "And so it came to pass on March 29, 1973. The game featured Finley’s A’s (of course) taking on the sad sack Indians, who finished last in the AL East in 1972. Sadly for Finley, the experiment was not a success. However easy it might be to see an orange ball against a green background, there was one way the new ball was distinctly worse for offense. Hitters complained that they couldn’t make out the spin of the red seems on the ball, and so had more difficulty figuring out what was coming. For their part, pitchers complained that the ball was slippery. Also, there was no explosion in offense. The orange balls were used for two games, and then Finley agreed to end the experiment. Heck, for Finley half the point of trying something different was just to try and see what happened."